Sea-Tac Airport is raising the fees that Uber and Lyft pay to pick up riders at the airport, from $5 to $6 a ride. Usage of the ride-hailing services is soaring, while traditional taxis have seen a decline. You’ll soon pay $1 extra to take an Uber or Lyft home from Seattle-Tacoma International Airport to cover the airport’s rising costs to manage the soaring demand for the ride-hailing services. Uber, Lyft and other transportation-network companies, as they’re dubbed by Seattle, have been operating at Sea-Tac under a pilot agreement for 18 months. Under the agreement, the largest companies paid a $100,000 activation fee to the Port of Seattle, which operates the airport, and a $5 fee for each ride. That fee, generally passed on to the passenger, will rise to $6 per ride Nov. 1. The fees go into a general airport-development fund to pay for airport maintenance and improvements. The airport said that the $6 fee is in line with those at other airports and said that San Francisco, Los Angeles and several other cities charge per-ride fees in the $7 to $10 range. 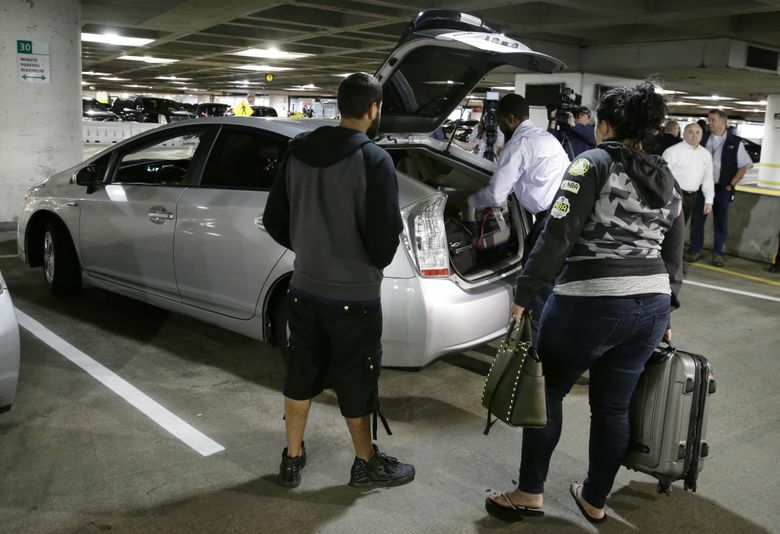 Sea-Tac said it has had to add staff and make changes to its parking garage and off-site holding lot to accommodate the rising demand for ride-hailing services. Total ground-transportation trips from Sea-Tac are up 13 percent over last year, the Port of Seattle said, and Uber, Lyft and similar companies are more-than absorbing the growth. Traditional taxi service from Sea-Tac dropped about 3 percent from September 2016 to September 2017, the Port said, declining from about 69,000 monthly rides to about 67,000. But the use of Uber, Lyft and their ilk from Sea-Tac has skyrocketed. In the companies’ first official month of operation at the airport, April 2016, they made about 40,000 trips out of Sea-Tac. After six months, by September 2016, business had nearly doubled, to about 74,000 trips per month. This past September, ride-hailing companies made nearly 121,000 trips, triple the number they made 18 months ago, and almost double the business that taxis are doing. The fee structure for taxis at the airport works differently. The airport has an exclusive contract with Eastside For Hire — it’s the only taxi company allowed to pick up passengers in the airport parking garage — that requires cabdrivers to pay the airport about $7 per ride. In total, ride-hailing companies provide about one-third of the rides from Sea-Tac, taxis and flat-rate car services provide about one-fifth and all other ground-transportation options make up the remainder.